Joseph Drambarean, Chief Technology Officer. Joseph joins Trovata after nearly four years at Capital One where he was at the forefront of digital transformation, leading product management as head of the innovation labs and mobile banking teams. Joseph is driving innovation around rapid deployment and customer onboarding, bank-grade security, and machine learning at Trovata, creating a more consumerized user experience for mid-market and enterprise customers. He has hit the ground running having already hired 4 top software engineers and data scientists from the digital banking space. Joseph will oversee all of technology and report to Trovata Founder & CEO, Brett Turner. Dave McCutcheon, Vice President Sales. Dave has been working with CFOs on addressing critical business challenges like Supply Chain Optimization, Human Capital Management, and Financial Close improvements for almost a decade. In 2014 he joined LA-based FloQast as the Head of Sales & Alliances where he helped scale the company from 6 to over 100 employees through three rounds of venture funding. At Trovata, Dave will be leading the company’s sales and marketing efforts and report to Trovata Founder & CEO, Brett Turner. These key executives join the team at their new offices in the emerging tech hub of Del Mar Heights, just north of downtown San Diego. The modern digital workspace is poised to accommodate up to 20 new team members for this next phase of Trovata’s growth. Trovata is poised to disrupt the world of digital corporate finance over the next year, bringing best-in-class predictive machine learning techniques to treasury management, accounting, and financial planning & analysis. As open banking continues to expand its reach, Trovata customers will be on the forefront of consuming real-time insights that will introduce unprecedented value and pace to their financial reporting workloads. Paired with a full ecosystem of digital tools including mobile, digital assistants, and next-generation financial management UX, the future is very bright for corporate finance and treasury. Trovata makes it easy for businesses to build and update their cash forecast by automating the work it takes to gather all the data. By bridging the gap between banks and accounting systems, Trovata is helping companies gain powerful insights into their cash inflows and outflows that drives better and quicker business decisions. Today, Trovata is helping companies transform finance and treasury operations with revenue between $20 million and $2 billion using open banking and machine learning. In most cases it takes less than an hour to get setup. Trovata is based in San Diego, CA. To learn more visit www.trovata.io. 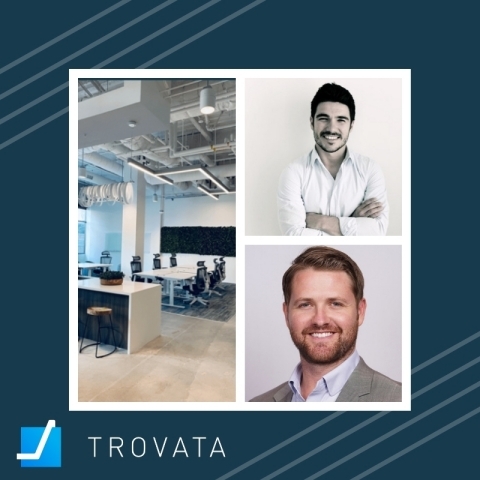 Trovata.io, a leader in automating cash management and open banking for businesses, today announced it has added two key executives.